If you read this blog regularly, you probably know I don't like to waste anything. This even extends to scraps of food. Recently, I set out on a mission to see just how many meals I could get out of one rotisserie chicken. Probably what sparked some of my interest in this little adventure was the fact that our new Whole Foods that opened nearby advertised free rotisserie chickens if you spent $25 there. Of course I can spend $25 at Whole Foods. I love going to Whole Foods. It is actually a fun event to go there--the kids even love it because of all of the wonderful samples they usually give out. So, we went and I got a free organic rotisserie chicken. First, after arriving home, I pulled off all of the chicken. I used half of the chicken to make yummy tacos that night for dinner. (I used this recipe and replaced the grass-fed beef with the chicken). Since the chicken was already cooked, I simply spiced it up with some cumin and turmeric over low heat, and added in some Muir Glen Black Bean and Corn Salsa. Complement those tacos with some chips/salsa and salad, and boom, meal number 1 is complete. We actually even had leftovers for the next meal. Later that night, I placed the rest of the chicken carcass into a crockpot, along with some veggies and water and made some overnight chicken stock. 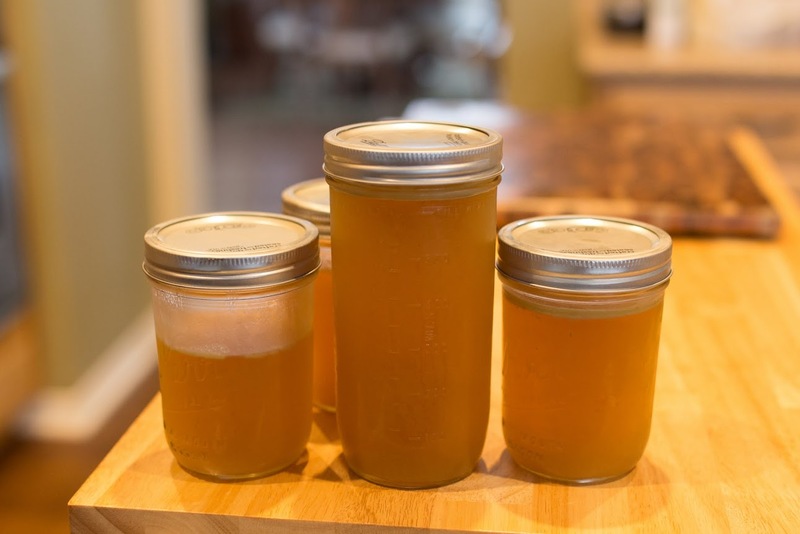 If you have never made your own chicken stock, let me tell you something: you are missing out! It flavors recipes SO MUCH BETTER than the stuff you buy in the store. Plus, the stuff you buy in the store is usually full of junk, some of which a normal person can't even pronounce. I have tried a couple of different recipes for it. The best one was the one I made with a whole chicken I roasted at home. I think the difference was in the spices used to roast the chicken. I seasoned my roasted chicken with rosemary, and it ended up making the chicken stock very delicious. The rotisserie chicken from whole foods also made flavorful stock, but it was just a different flavor over the other. Otherwise, there wasn't much different in the recipes I used. So, you can use this super-easy recipe for overnight crock pot chicken stock from the 100daysofrealfood.com site and have a delicious stock, no matter what chicken carcass you use. Click HERE for that recipe. The picture above is just about half of the stock that this recipe made. I placed the other half into the freezer to use later. I have used the stock to make homemade chicken pot pie (a healthy from scratch version, of course, with homemade whole wheat crust), and several different soups which have become our favorites. Soups are just perfect vehicles to sneak some veggies in your diet. So to recap--this particular round of stock help make the chicken pot pie, chicken tortilla soup (also using the rotisserie chicken), a La Madeleine's Creamy Tomato Basil Soup, and a yummy lentil soup. So, if you are counting, that one rotisserie chicken help to make 5 meals. Oh, and I ran back to whole foods yesterday and I picked up another one of those chickens (yesterday was the last day of the special deal). So, we had some soup and some chicken/cheese paninis for dinner last night and tonight. Before I finish this post, I am going to leave you with one of the soup recipes. If you want any of the other recipes, let me know and I will be happy to share! (This recipe is excerpted from an article by Beverly Bundy of the Fort Worth Star-Telegram around May 20. 1994. She wrote, "Once a year, in January I run a column of our most requested recipes -- This year, that column included the recipe for La Madeleine's popular tomato basil soup. I continue to get at least 10 calls a week asking for the recipe. So here it is, once again -- "). This soup is delicious! Enjoy!